Shocking. Mc Donald is pulling out from Iceland . Pronto. Tata. Sayanora. 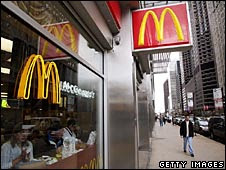 McDonald's is to close its business in Iceland because the country's financial crisis has made it too expensive to operate its franchise. The fast food giant said its three outlets in the country would shut - and that it had no plans to return.Besides the economy, McDonald's blamed the "unique operational complexity" of doing business in an isolated nation with a population of just 300,000. Iceland's first McDonald's restaurant opened in 1993. The franchises are run by a firm called Lyst, with owner Jon Gardar Ogmundsson saying the decision was "not taken lightly". He said that the restaurants imported the goods from Germany, but that costs had almost doubled, with the falling krona making imports prohibitively expensive.Mr Ogmundsson said the restaurants had "never been this busy before... but at the same time profits have never been lower". "It just makes no sense. For a kilo of onion, imported from Germany, I'm paying the equivalent of a bottle of good whisky," he added. He now plans to run the restaurants under another name so that he is able to buy cheaper Icelandic products.Iceland's banks collapsed at the height of the global credit crisis - wrecking the country's economy and forcing it to rely on an $10bn (£6.1bn) international aid package. Food for thought. Guess McDonald's is not invincible to world violate economy. No worries for us as the local McDonald's franchises as is still growing and booming. Unless we suffer the same fate like Iceland in near future .